I know better. Really, I do. I know what God's Word says. And after nearly 14 years of marriage, I know better. When writing the "Nightcrawlers" post the other day, I debated whether to share personal information. It is challenging at times to know how much is too much to share. I want to be transparent. I want the walls of my life to be glass so you can see into my soul. I am not perfected and will not be until Jesus returns. I pray you will allow me to make mistakes in front of you and give me grace as we walk this walk together. I trust the Lord will tell me how much to share and what not to share. So, I am proceeding with permission from the Lord and my wonderful spouse. I know what you are thinking about that cute sweet couple up at the top of this page They look perfect. Well, we are. ; ) Ahem...ok, we are not. Last week, we were far from perfection. I think it started Monday night last week. Don't ask how it started. I couldn't tell you. I wasn't even really angry at first, just a smidge irritated. I don't remember why (which is good--Love doesn't keep a record of wrongs). I went upstairs to go to bed. I crawled in bed with my back to his side of the bed, completely shutting myself off. "I really should talk to him. Don't go to bed angry, you know better." I justified,"But, I'm really not angry, it will be fine. I don't feel like talking to him. We can talk tomorrow." Tuesday night, the same thing happened over something similar and trivial, only this time, it was multiplied since the night before was still unresolved. By Wednesday night, I was exponentially angry from three nights in a row of unresolved issues. Again, I went upstairs and shut myself off. Chris knew something was up and he thought it best to stay clear of me, which in turn caused me to be angrier. Talk about one vicious, awful, destructive cycle. "Sue, you know better. Stop this. Go talk to him. ", the Holy Spirit gently nudged. My reply to the Holy Spirit: "He should realize something is wrong and come talk to me, why do I have to be the one." By Thursday night I had decided that I was going to talk to him. I was going to tell him what he had been doing wrong all week. It seemed like a good idea....at the time. Ok, God, I'm going to talk to him. Let's just say that didn't go as planned. Again, I turned my back to his side of the bed and went to sleep. "It is ok, I'm not really angry, just annoyed. We can talk tomorrow." How long was this going to continue? I was miserable. Lord, help me. Help us. So, I decided what we needed was a date night. A date night would take care of everything. Get away for an evening. Reconnect. I arranged a babysitter. Texted Chris. All set for a wonderful evening. Well, to make a long story short, date night did not exactly go as planned. Dinner was....well,.....awkward. We always request a table away from the noisy kitchen. However, this night a noisy kitchen would have been welcomed over bitter silence seasoned with a couple of flare ups from pent up frustration all week. We spent most of dinner in silence doing our best to keep our eye gaze strictly focused on our plates of Italian cuisine. We left the tree adorned Italian restaurant barely uttering a word. The agonizing silence continued in the car. This has to be the worst date night ever! In my husband's wisdom and Holy Spirit's leading, he didn't take me home. He parked in a parking lot of a church near our home. In that parking lot, we sat, talked and talked and cried (well, I cried, he doesn't cry) and talked some more. Openness. Forgiveness. Healing. Comfort. Hope. God began to break down the layers of anger built by night after night of avoidance and unresolved conflict. God healed our hearts and drew us to Him. We needed Him. We needed the Cross. All was resolved. We prayed together. PRAYER, so powerful...so pertinent. In retrospect, not only did we avoid each other that week and avoid resolving issues, we ignored the Holy Spirit. I am so sorry, Holy Spirit. I am sure it grieved Him. We neglected the Word of God. We gave the enemy an opportunity, and boy, did he take advantage of it! What would normally had taken just a conversation to resolve (most of the issue was from a misunderstanding, imagine that! ), took about 3 1/2 hours and $28 for a babysitter. And the thing is...I knew better. Keeping with the theme of inviting worms into our homes. There is another "worm" we do not want in our homes! This worm wiggles its way in during the night and causes spiritual deterioration to the foundation of your home. This worm is a nightcrawler. Have you ever had a fight with your spouse just before bedtime? If you haven't, you probably aren't married. For Chris and myself, it seems to be when most conflicts occur for some reason. Perhaps we are tired and more vulnerable to conflict. However, more likely it is because the enemy knows that if he can cause division and discord that is unresolved before bed, it opens a door for him into your life. Nightcrawlers are also typically used as bait for fishing. The enemy knows that if he can get you to take the bait, it will give him entrance into your home. When we go to bed angry, we are taking the bait and giving the devil an opportunity to to cause division in our homes. Nightcrawlers eat decomposing matter and garbage. Strife and division are garbage. Sin is garbage. When we allow sin to spend the night with us, we are inviting "worms" into our homes. These "worms" just get stronger and stronger when left unaddressed and allowed to fester. The Lord is giving us a warning here in Ephesians. The divorce rate in this country among Christians over 50 percent! I think in some cases, if not most, people allowed nightcrawlers into their homes. What started out as a little foot in the door can lead to a full blown invasion. An issue that maybe started out small is now mountainous. Many times they don't even remember why it started! It is because a small conflict was left unresolved and they went to bed angry. If you and your spouse have unresolved conflict, I encourage you to do whatever it takes to resolve it. If you need to go on a date and spend the whole night talking and talking, do it! The cost of a babysitter is much less than counseling or a divorce! I know these are harsh words, but truth sometimes is harsh. If your situation will take more than a night away talking, then I encourage you to seek counseling. Again, counseling may be expensive, but it is not as expensive as a divorce! And I'm not just talking about finances here! Don't go another day letting the enemy devour your marriage. Don't take the bait any longer. Talk out the issues at hand and resolve the conflict. Cast that strife out of your home. Make a pact with your spouse to not go to sleep until you are hugging and kissing and all is forgiven. Don't let the sun go down while you are still angry. Don't let those worms into your home! You may be wondering about the title. What is that all about? It is very relevant to what I mentioned the other day about letting worms invade our homes. My husband, Chris, and I find it challenging to find anything decent for us to watch on television. So, when we do watch TV, it is usually HGTV. However, we found a reality show recently that seemed OK for us to watch. It was a fun show with no indecency. However, a few weeks into the show, I started to notice something.....the couples on the show were constantly fighting. I found myself getting agitated during the show. I would find myself getting irritated at my husband also. Which caused me to wonder...What is that all about? A couple of weeks ago, I decided I wouldn't watch the show anymore. The fun was gone, I wasn't enjoying watching couples argue and bicker. Neuron mirroring explains why yawns are contagious, why people get so excited at football games, why we make funny movements with our mouths when we feed a baby, and why we get agitated after just watching other couples bicker. The eyes and the heart are interwoven beyond our understanding. We may unknowingly be letting "worms" sneak into our homes by what we are watching, even when it seems harmless. I mentioned the other day some "worms" I don't want in my house including strife, unforgiveness, offense, selfishness, and rebellion. The show I referred to earlier was sowing discord and strife in me by causing my neurons to fire in response to arguing even though I wasn't the one arguing! My emotions were "mirroring" what I was observing! In the Bible, we can find an interesting example of this in Genesis 30. There is a story about how Jacob put speckled rods in front of the eyes of the sheep and they conceived sheep that were speckled even when it went against genetics. We become what we observe and associate ourselves with. Like I said, the eyes and the heart cannot be disentangled. They are connected at the deepest levels. If keeping God's word in front of our eyes brings life, then wouldn't be putting images in front of our eyes that conflict with God's Word bring forth death or destruction? Death doesn't have to mean a physical death. It can be a slow death of a marriage or a death of joy or peace, etc. Just as Jacob's sheep bred sheep that reflected what was put before them, does constantly watching sin breed sin? Hmmm. Something to consider? If you are convicted when watching something, don't ignore the warning. God may be drawing your attention to a "worm" that is trying to sneak into your home. Last week, Sarah, my five year old, came in the house from being in the back yard, suspiciously carrying a shovel filled with dirt. Curious about why she was carrying dirt up the stairs, I inquired, "Sarah, what are you doing with that shovel?" She apprehensively replied, "I am carrying my pet worms upstairs to their home." "You have worms in the shovel?" "Yes, they are my pets." "No, you have to set them free. We aren't going to have pet worms in the house. They won't be able to live in the house, they will die." Protesting a little, she insisted that her friend, Evan, had pet worms in his house and they didn't die. Then, disappointed that she would not be able to keep her new pets, she obeyed and put the worms back outside. I don't know about you, but I don't like the idea of having worms in my house. They are slimy, yucky, and give me the hebegebies. I am not a fan of creepy crawlies. Are there times we unknowingly let worms into our homes? When worms are mentioned in the Bible, they are synonymous with destruction. They break away, tear down, and devour (Ex 16:20, Deut 28:39). You will plant vineyards and cultivate them but you will not drink the wine or gather the grapes because the worms will eat them. Worms are devourers, they devoured the blessing. So, what are some "worms" we might unknowingly bring into our homes? They sneak in little by little. One big worm that comes to my mind immediately is "strife". Oh, how I cannot stand strife! Other "worms" could include unforgiveness, offense, selfishness, and rebellion. All these worms are rooted in the monstrous sin of pride. The word "fat" above doesn't have anything to do with a scale. It can also be translated "prosperous". "Fat" is the opposite of being "devoured". We don't want worms to eat up our blessings, instead we need to put our trust in the Lord and walk in His ways. Then we can experience His fatness, His prosperity, His blessings. No worms in this house!!! Later this week, I am going to give examples of some sneaky ways worms might wiggle up our staircases and into our homes. No pet worms!!! My parents had driven all the way from Illinois for a visit. The main reason for their visit....to see their granddaughter in her first season of cheerleading. It was a hectic night and in the midst of the chaos, the pom poms were left at home. For some reason it really bothered me that we forgot her pom poms knowing the grandparents had driven that far to see her cheer. After all, what is a cheerleader without her pom poms, right? Well, it didn't bother Sarah one bit! 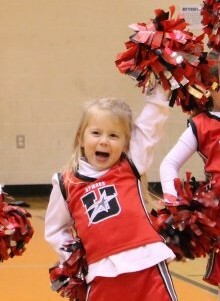 She just cheered her little heart out without her pom poms. That little setback wasn't going to stop her from cheering! In fact, several of the other girls also decided to leave their pom poms on the floor and cheer without theirs as well! Lesson from that night: When life causes you to not have your pom poms.....Cheer anyway! In fact, when you do cheer anyway, others will follow your example and positive attitude. They will want to know what you know and do what you do. Whenever we are facing a trial, we could just get down and discouraged. Pom poms are the color and pizazz of life. However, when our lives are not full of pizazz and color, what will we choose? When our lives are full of the mundane, what will we choose? If we are facing a difficult time, what will we choose? Will we choose to sit at the sideline of life? Or will we choose to cheer anyway? God says to be of good cheer or "be of good courage" is another way to translate it. Put your hope and trust in Him. He says that He has overcome the world. He has overcome whatever trial you are facing. Nothing is too big for Him. It isn't that He will overcome it, He has already overcome it! Sometimes, we just need to wait on His timing to see the answer. I hope Sarah's example will help you remember that next time life causes you to not have pom poms, go ahead and cheer anyway! God is your help, He is your strength, He has already overcome anything you are facing. You are victorious in Him! So Cheer! V.I.C.T.O.R.Y......THAT IS OUR BATTLECRY! Do you have a decision to make? 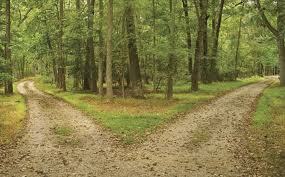 Are you at two roads (or more) and not sure which one to take? As I wrote those last two words, I felt the presence of the Lord, the great I AM. He will direct you. He will guide you. It is His promise. The Great I AM is there. He is already in the future. He is at the beginning and the end. He sees the finished picture. It is nothing less than beautiful. His plans are beautiful, and the outcome is good. He will lead you. His loving eye is on you. Just Trust. The other day I wrote about how we are attempting to teach our kids with the phrase "I Don't Prefer This" during dinner as a polite alternative to "Yuck, I don't like that!" Last night, I made noodles with chicken and vegetables and again, my little 5 year old tried to say "I don't prefer this" to opt out of the meal. It is super cute when she tries to say it. Of course, I want her to eat it because vegetables and chicken are good for her and help her grow. I try to tell them "I would not give you anything bad, trust me." However, it doesn't always suit their taste buds. Today, I want to continue with a different application. God has been stirring this message in my heart all weekend. There are situations, circumstances, events, occurrences, annoyances, that happen every day. Many times they are small. Sometimes they are big. They all require God if we are to walk through victoriously, and thankfully He is always bigger than any of it. I don't know what you are dealing with that may cause you to want to cry and say, "I don't prefer this, God". God always answers prayers, but sometimes He doesn't remove a difficult situation right away. Why is that? Sometimes we have to walk through the situation until He delivers us. In Daniel 3, we find the story of Shadrach, Meshach, and Abed-Nego. (Notice these names are not in any baby name books!) They did everything right, yet they were thrown into the fiery furnace. I am sure they were hoping God would deliver them before they had to go into the fire. However, they were certain that He would deliver them. Do you hear their certainty? Do you hear their faith? "He will". It doesn't take much faith to believe, "God can", (of course He can), but faith believes that "God will." Faith is the expectation of a positive outcome. It is believing God will do what He has promised. "'Look!' he answered, ' I see four men loose, walking in the midst of the fire; and they are not hurt and the form of the fourth is like the Son of God.'" The fourth person in the fire may have actually been Jesus! As a result of their obedience and trust in the Lord in a "I don't prefer this" moment, God was glorified. Like mentioned above, our kids may not prefer to eat vegetables and chicken, but we know that it will help them grow and get stronger. The circumstances we do not prefer have the capacity to help us grow and make us stronger in our faith. This is kind of an "ouch" verse. We don't like to hear that God may use trials to refine our faith. However, that is what it is saying. So the question really is how will we respond when trials come? Will we choose to trust? Will we believe that our God will deliver us? I pray we would hold onto that fourth person in the fire with us. He is always with us. He promises when we walk through what we do not prefer while trusting in Him, that the fire will have no power over us! We will come out of it not even smelling like smoke! God may deliver you quickly, but if not quickly, He will deliver you. If you do end up having to walk through something you do not prefer, remember, Jesus is there with you. He will never give you anything bad, trust Him. It may not taste good at the time, but it is always good for you even if it doesn't suit your taste buds. He never leaves you. He never forsakes you. If you have to walk through, it is for a higher purpose, so that your faith may result in the praise, honor and glory of the revelation of Jesus Christ. Trust Him. We have been working on dinner manners at our home. A long ongoing and ongoing process with three kids. One thing we have been addressing is how to turn down an option politely. We were at home eating dinner the other night and five year old Sarah said, " Mommy, I don't deserve this." I have to admit at first I thought she was thinking I was punishing her with my cooking! Then, I realized what happened....she mixed up prefer with deserve. Both words are a little tough for a small child to say. This incident got me thinking about these two words....Prefer and Deserve. To "prefer" means "to like it better or put it before something else". To "deserve" means "to be worthy". What the Lord is saying here is to "prefer" others. Put others first. Isn't that what He did when He went to the cross? Didn't He put us before himself? He preferred us over Himself. 1 Cor 13: 5 says that love is not self-seeking. Love cares for others more than self. "And just as you want men to do to you, you also do to them likewise." "But I say to you who hear, 'Love your enemies, do good to those who hate you, bless those who curse you, and pray for those who spitefully use you.'" Bless those who hurt you. Being real....that can be hard at times. Prefer others over yourself even if they do not deserve it. At those moments, we need to take a deep breath, smile, and choose to love. Sometimes we have to make an effortful choice to prefer even when our flesh is screaming, "Yuck, I don't like that!" Jesus preferred us when He went to the cross. He did not give us what we deserved. God doesn't measure what He gives us by what we deserve. We would be in a world of hurt, it that were the case! We cannot do enough good to earn His saving Grace. Let's give others the same preference and give them grace also. Choose to prefer. Choose love. The next time someone mistreats you or wrongs you and you feel like saying, "I don't prefer this" or "I don't deserve this! ", think about how to respond as Christ would respond. Ask God how to respond in love and prefer others. Our kids often get a small treat at the end of dinner if they eat everything, even those foods they "Do not prefer". Remember, when you endure with love something you do not prefer or deserve, He promises your reward will be worth it. And it will be better than just a small treat!